The only options you had previously to upgrade from an older copy of Windows to a new one was to run the installer either while the installed operating system was running or by booting from an installation disc or Flash drive to initiate it. Microsoft wants to make things more comfortable and has added an option to upgrade to Windows 10 using Windows Update. Windows Update is the operating system's updating service which is best known for delivering security patches once a month to supported Windows devices. The core benefit of upgrading via Windows Update is convenience. You don't need to download the ISO image of Windows 10, don't need to burn it to DVD or copy it to a USB Flash Drive, and don't need to run it afterwards on your system. Note: Windows 10 is not ready for prime time yet and it is not suggested to upgrade your work system to it. It is ideal if you have a spare system and want to try it out or a full backup that you can restore. The first thing you need to do is downloaded a small program from Microsoft which prepares your Windows 7 or Windows 8 operating system for the upgrade. It is a 10 Megabyte file that runs automatically on your computer after you execute it. It requires a restart of the PC so that the changes it made take effect. The device will boot into the current operating system after restart. Open Windows Update on the PC now. You can tap on the Windows-key, type Windows Update and hit enter to do so. There you need to click on the check for updates button. It may take a while for the check to complete. In the end, the update to Windows 10 should be displayed which you can run with a click on the install button. As you can see on the screenshot above, the update has a size of 2.8 Gigabyte. The download may take a while depending on your Internet connection speed. The update installer runs the same upgrade process as the ISO installer. It seems possible to go back to the old operating system after the update. While that is the case, it is highly suggested that you create a backup of your important files and data before you proceed with the update. Update: Some users have reported that they had no option to go back to the old operating system after upgrading to Windows 10. As I said earlier, if there is any chance that you may want to go back to the old system, do a full backup so that you can restore it. If you are running a 32-bit version of Windows, you cannot upgrade to 64-bit versions of Windows 10. There is also no option to change the interface language during the upgrade process. You can remove the "update to Windows 10 preparation update" again from Windows. You find it in the installed updates list as "Update for Microsoft Windows (KB2990214)". Windows 10 will be a free upgrade in the first year to all (home) customers who run Windows 7 or Windows 8.1 devices and it is likely that Microsoft will make Windows Update one of the delivery options for the update. Now You: What's your Windows 10 upgrade experience? Find out how to update to Windows 10 from Windows 7 or 8 using the built-in Windows Update feature. I hide the KB2990214 for while, because I’m waiting for the final Windows 10 release. No issues with the update. Did it on a ThinkPad X200 running Windows 7 Pro. Works well enough. I can understand some of the jankiness in the build. Hate the fact that I need to sign in to my MS account to use Cortana or any other service. Windows 10 sounds like it will be a good move for me to make when the time comes, but there will be some sad loss too. Each of these, and more I’m forgetting, have been very handy on Windows 7. Perhaps I can cobble together pieces from here and there that will duplicate these soon to be lost items, but then I’ll have to re-cobble when Windows 11 and 12 show up. I’m disappointed that each new Windows iteration seems to add a lot of functionality I don’t need, which is OK, but also takes away stuff that is demonstrably useful to me. I still keep Windows XP and Windows 95 machines in running order just so I can run some old but excellent programs on them which I have not been able to run on Windows 7, my main machine of the moment. Maybe I’ve been looking in the wrong places, but are the game and application programs now integrated and shipped with Windows 7 going to be available to install and run on Windows 10? While I’m asking, how come the virtual machine people never seem to mention running programs from Windows 3.1 and Windows 95 on Windows 7 or 8? Maybe the VM developers are too young to remember the good old days. 1. Windows Back-up is still in Windows 8, but it’s called Windows 7 Back-up in Control Panel. 2. You can probably copy-paste the .exes to your new system. 3. Have a look at Classic Shell. It makes Windows 8 acceptable. 4. £10 upgrade for the media pack, or something like that. Pretty reasonable considering the savings to people who use 3rd party software, or don’t use those features at all. I got it free when it was on offer but haven’t used it cos I use VLC for DVDs. I run a few Windows 3.1 programs on Windows 7. Nothing beats TheGun and TopGun for opening 20GB text files, for example. Programs were written properly back then. Out of interest, could you list some old programs that you still find useful? One old favorite of mine that runs in a DOS command box on Win 95, but apparently on nothing newer, is called NAMEGRAM. It accepts a text string, such as a name or phrase, and lists all possible words that can be assembled using all the available input letters. Basically, it creates anagrams of phrases. Example: “george p burdell” can be rearranged to spell “purged rebel log”, and many variants. Another missing program, incredibly, is Scrabble, the fine old word game with millions of players. Why the owners of the Scrabble name do not make a workable program available beyond Win XP must be a sad tale of lost revenue and angry but faithful customers. Any new game should take the variety of adult/tournament and kiddie dictionaries into account, but that’s another story. As you suggested, I tried but failed to find Windows Backup on a Windows 8.1 system. Where is it hiding? Martin: This may make things easier or more convenient as far as updating the OS is concerned, but does it ensure that users will be able to keep all of their installed programs, or do they need to be reloaded from scratch? If it’s the latter case, then is it really any different or any better than just making a clean install of Win 10 to begin with? Let me give my personal background as an example. When some months ago I bought new hardware running Windows 8.1 preinstalled, I ended up paying extra to upgrade to a “Windows 8.1 Pro with Media Center” OS version. I felt cheated but I had to, because in my remote slow-internet home situation I need to use a digital card-based pay channel antenna tuner for TV reception and recording. And yes, Windows Media Center happens to be the only software solution that works almost flawlessly here (I tried at least four alternative “media center” programs and they all had bugs, reception and usability problems, or even worse: recording failures or crashes). So for Windows 10, one of my own very first questions would obviously be this: will Windows Media Center continue to work after an update from 8.1 Pro to 10? Or will it be left out by default again, like it was sneakily scrapped from the “normal” versions of 8.1? I’m sure many people may have similar questions regarding various other pieces of software. But as best as I tried searching, I could not find a single piece of real, specific information from Microsoft about how compatible Windows 10 will be when it comes to supporting elements of a previous 8.1 installation: not even when this is (as with Media Center) about software by MS itself. Looks like for the moment, the Microsoft people prefer to keep blabbering about the blessings of trendy new gimmicks such as Cortana, instead of focusing on the continuity and the factual information that to some users may in fact be a lot more vital. For myself, I will waste no more time thinking for even one second about updating from Windows 8.1 to Windows 10 until Microsoft has finally published real, detailed info about all the consequences of such an update. I don’t know 100%. Microsoft did mention that you can upgrade to RTM from the preview but how that looks like, I don’t know. That sounds quite similar to the scenario when the user performs a repair-reinstall in Win 7, except that certain Windows settings won’t be retained. But for repair-reinstall, I understand that there is a moderate risk whereby drivers would go missing. Might the above the case as well for the Win 10 upgrade via Windows Update ? Do Win 7/8 users have to backup or download the latest device drivers beforehand ? Or is the Win 10 upgrade more like upgrading Win 7 to Win 7 SP1 via Windows Update (or the standalone .exe installer) ? I cannot say. I only updated Windows 8.1 to 10 and it retained installed programs and apps, well most of them and I did not have to install drivers. @Martin — Thanks for the info wrt upgrading Win 8.1 to 10. Perhaps you could share with readers which of your Win 8.1 programs/ apps stop functioning after the upgrade. I wonder if more things might get broken for users doing an in-place upgrade from Win 7 to Win 10. Afterall, this requires jumping up 3 versions. For instance, based on past user experiences, Win Vista-compatible drivers may or may not work in Win 7, while Win XP drivers most probably do not work in Win 7. Nah, you keep all your stuff. Doesn’t mean everything will still work though. Microsoft have a tool that lets you check your system prior to upgrading. Note that Microsoft chose to prevent some of their own older programs from running on Windows 8 and above. The ability for vendors to blacklist their own programs is a feature of Windows 8. As I remember, you can turn it off by turning off compatibility checks. Some Googling required. Speaking of clean install, will it be possible, if necessary, to do a Windows 10 clean install later? I share Gary’s question, wonder if we will register an account or something in order to download full iso’s of 10 for those who prefer to do clean installs, and if so, will that still be free for owners of windows 7. @qwerty — It appears that users wishing to do a clean install of Win 10 might have to wait till at least 2016, ie. after the 1-year “special offer” of free Win 10 upgrade via Windows Update for Win 7/8 users. After the 1st year of availability, the free Win 10 upgrade via Windows Update will cease, & Microsoft reportedly will sell the Win 10 installation DVD (& perhaps the ISO file) as per normal. So no, it seems that a clean installation of Win 10 for existing WIn 7/8 users won’t be free of charge. I thought as much, thanks PJ. I was able to download the 3.92GB iso file but before that i signed in first with my outlook email account. I was also given a product key when I download the iso file. Just finished installing from a spare laptop and maybe later will activate the OS with the given product key. Will we be able to get a Product Key when we get Windows 10 using the Windows Update feature? You will get a product key when you download the iso file. I not recommend to upgrade from existent installation, we are not in the early 90’s where the new installation takes 8 or more hours. So a fresh copy is always a better start, if you like to play with backups, why not, to restore your old stuff. And remember this is only a preview (internal beta) OS. The problem is that is not like linux only a kernel upgrade which can also be rolled back it also change a lot of stuff including some of your software/configs and we don’t nothing about these internal changes, and it may be changed again with newer updates or builds. – Yes, you need a product key on a clean and fresh installation from DVD/usb or whatever. – No, you don’t need a key if you upgrade from 8.1, since MS said they give this upgrade 4-free. Let us suppose I have a windows 7 installed on my laptop.I update it to Windows 10 using “Windows Update” method. Now after sometime in the future my windows 10 gets corrupted and also I am not able to do “Refresh” or “Reset” thing. My only option will be to do a full OS installion through DVD or Bootable Pendrive.Since I updated windows 7 to Windows 10 through with “Windows Update” method, I do not have a windows 10 DVD. So what can we do I this scenario. Do I have to install windows 7 again and then perform windows 10 update? Will I get another product key which will help me to download windows 10 ISO? @Abhi — Note that the current Windows Update is offering the Win 10 Technical Preview (ie. a pre-release still at buggy testing stage), & not the stable version. 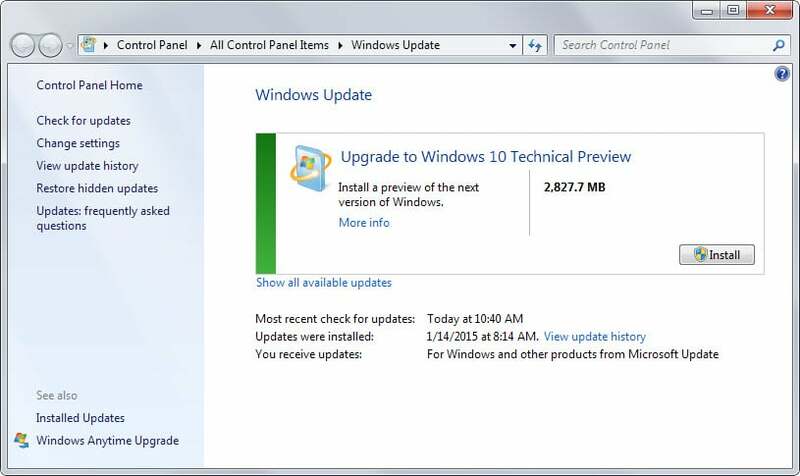 You don’t need any Win 7/8 product key to download the Win 10 Technical Preview ISO installer. Microsoft provides the default activation code (NKJFK-GPHP7-G8C3J-P6JXR-HQRJR). As we can already guess, it is unlikely that this pre-release default code can be used to activate the Win 10 Stable version (to be sold on installation DVDs in 2016, & perhaps also made available as ISO download). Loaded the Windows Tech preview onto my Windows 8.1 machine but could never get it to recognize my Canon MF4880 printer. Worked for hours on this trying every forum and MS suggestion. Never got it to work so returned to 8.1. Will try again when the stable product comes out. I upgraded my main computer to Windows 10 using the link and instructions you provided. I was amazed that almost all my programs (except for Virtualbox) worked perfectly, and that it was running smoothly. But after some more testing, I started to notice bugs and annoyances (like being unable to disable web searches on the new search bar, and not being to type file paths in it as I do on Windows 8.1.). When I tried to install an old version of Virtualbox (I read on its forums that that old version works on W10), it crashed, and after restarting my computer, Windows 10 just gave me a blank screen. I got fed up with it all and used the “rollback” option. In 5 minutes, I was again to Windows 8.1. Summary: don’t act on a whim like me. Install it on a virtual machine, or wait for the final, stable version. 1. Do I have to do all the previous MS patches before upgrade to W10? 2. My Internet is slow, how can I deal with the update? 3. What can I do, if the update is failed, and the computer is frozen? Note that although Microsoft unofficially denies it at the moment, there are still rumours & uncertainty over whether Win 10 / “Windows As A Service” would eventually be subsumed under a cloud computing structure & subscription model. The proposed model requires recurring payments for continued support & usage. Although the idea is to deter piracy, I foresee that less well-off users might have to give up Microsoft products in that event. I downloaded this from the link that Martin provided above. However, I could do with some guidance please. While it was downloading, I read the warnings underneath and immediately cancelled the download, yet it still downloaded. Its size is 2,823.5 MB. Now, I’m being prompted to install it, but I’m unsure if it is safe considering the warning from the Windows download site??? I would not install it if you are in doubt. I have bookmarked this post for any further updates you may publish later. I wonder if Windows 10 will be a combination between 7 and 8, as Windows 8 wasn’t too popular. That’s all well and good, but it doesn’t stop it from nagging me to install and it cannot be removed? Thanks. I tried that, although all that does is to hide it without removing it. Is this definitely the case? I have a new Lenovo Flex 10 netbook which is very slow and which has given me my first experience of Windows 8.1, a nightmare! I’m not worried about data retention etc, so can I just install Windows 10 preparation and then the OS via Update, and revert to Lenovo’s factory settings if necessary? Or could I set a restore point? Sorry to be uneducated but am under the weather and just can’t get my head around it at the mo. Creating a restore point doesn’t seem to work. Once you download the Windows 10 using Windows Update, it cannot be removed. Once again, Martin Brinkman who has acquired quite a reputation for misinformation and actually causing more problems, has yet again proven that he is utterly unqualified and inept when it comes to all things I.T. Be warned, heeding his advice can be dangerous. Unfortunately, I only downloaded this from a link directed to this site. Martins,is it possible to dual install or is it dual boot windows 10 on a windows 8.1 machine? I wanted to install it on a VM virtual machine but couldn’t; can you assist? For what it’s worth, I’m currently triple-booting Windows 8.1 and 10 with Linux on my backup/test PC and it’s working well so far. I tried to get the windows 10 update,it said my computer was compatible so I took the steps listed above. About 90% of the way into the update it restored my computer back to windows 7,any ideas on how to fix it? My experience with upgrading Windows 7 Ultimate to Windows 10 Pro took two days and was an epic fail. It ended up crashing and restoring the previous version of Windows after all that time. Will try again tomorrow. I may try it with an ISO instead. From a Windows 7 or 8 device, go to the webpage named “Windows 10 free upgrade” for customers who use assistive technologies. Click on the Upgrade now button. Run the executable file to install the upgrade. For more please do read the article and follow our website as well.